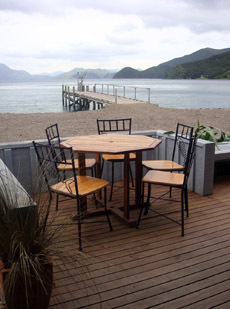 Set in a sensational location, the d’Urville Island Wilderness Café offers one of the finest waterfront dining experiences in New Zealand. Enjoy the magnificent views of Catherine Cove and surrounding native bush and wildlife whether dining inside or alfresco on the outside deck. Our menu is ever changing and designed around fresh seasonal produce – where possible. At the end of your day, there is nothing more relaxing than sitting out on the deck that surrounds the bar and restaurant, watching the majestic sunsets while sipping on a coffee or a drink of your choice.